Dock Levelers Toronto | Maintained Tilt Dock Leveler | Universal Door & Equipment Ltd.
A dock leveler is variable grade ramp platform that is designed to be used as a bridge between the loading dock floor surface and the surface of the load bed of a transporter vehicle. A dock leveler allows for safe and efficient loading and unloading of goods to/from a transporter vehicle using forklifts or pallet trucks. 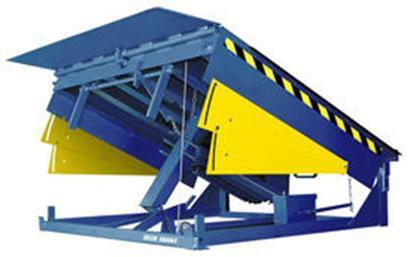 A dock leveler must be able to support extremely heavy loads. 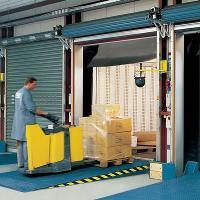 It must also must be able to service a wide range of load bed heights and accommodate unevenly distributed loads. Our Dock Leveler incorporates a "floating" rear hinge, otherwise know as Maintained Tilt , that allow the deck plate to tilt to accommodate canted load beds. When integrated with a Vehicle Restraint, the result is a dock leveler solution that reduces movement of the load bed and optimizes safety and efficiency. Our Dock Leveler is designed to withstand the repeated abuse of dynamic stresses, while maintaining its versatility and structural integrity. Once installed, your new dock levelers will make loading and unloading an easier task. No matter what type of vehicle arrives at your loading dock, adjusting the ramp so that it fits perfectly and allows for safe access will be a simple task. We offer a wide range of capacities, deck sizes, deck constructions and both hydraulic and mechanical operation to suit virtually any application, in any environment. Mechanical dock levelers are spring biased upwards and incorporate a hold down mechanism, while hydraulic units are powered by an electro-hydraulic system. Remember that levelers are not just for loading docks. When you install levelers inside your facility, using lifts or push trucks to haul raw materials or finished goods between departments will be easier since the ramps effectively eliminate the stress caused by trying to move over uneven thresholds between compartments. Regardless of your application we have the most economical and durable solution at Universal Door.
" We're absolutely thrilled with the long-lasting and energy efficient appliances of this company. Will recommend this company with confidence. Remarkable results, thanks so much! "